Are you the type of leader people want to follow? You can be—but first, you’ve got to understand what sets great leaders apart from all the rest. Certainly, leaders need people skills, execution skills, a deep knowledge of industry trends, the ability to articulate a vision, and more—they must be competent—but that’s just the tip of the iceberg. What’s below the waterline? What’s deep inside the best leaders that makes them different? The Heart of Leadership begins with young and ambitious Blake Brown being passed over for a desperately wanted promotion, despite an outstanding individual performance. Confused and frustrated, he turns to his former mentor, Debbie Brewster. Rather than attempting to solve Blake’s problem for him, she sends him on a quest to meet with five of his late father’s colleagues, each of whom holds a piece of the puzzle he’s trying to solve. As Blake puts the pieces together, he discovers that in the final analysis, a lack of skills isn’t what holds most leaders back; skills are too easy to learn. Without demonstrated leadership character, however, a skill set will never be enough. Most often, when leaders fail to reach their full potential, it is an issue of the heart. This is Blake’s ultimate revelation. This book shows us that leadership needn’t be the purview of the few—it is within reach for millions around the world. The Heart of Leadership is a road map for every person who desires to make a difference in the lives of others and become a leader people want to follow. 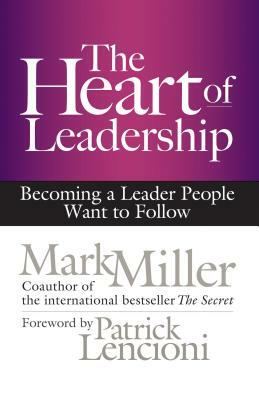 Mark Miller began writing about a decade ago when he teamed up with Ken Blanchard on The Secret: What Great Leaders Know and Do. Since then, his books have sold almost 600,000 copies worldwide. Miller encourages leaders through his posts on GreatLeadersServe.org. It’s rated as one of the top leadership blogs in the world and has garnered almost 2 million page views since its inception less than two years ago. Miller also sells chicken. He started his Chick-fil-A career working as an hourly team member back in 1977. He joined the corporate staff in 1978, working in the warehouse and mailroom. Today he serves as the vice president for organizational effectiveness. Miller also sells chicken. He started his Chick-fil-A career working as an hourly team member back in 1977. He joined the corporate staff in 1978, working in the warehouse and mailroom. Today he serves as the vice president for organizational effectiveness.